As clear as can be: no sooner you have inserted the banknote into the Soldi Smart Pro from ratiotec than it already gives you clear testing results. Within three tenths of a second the currency detector checks euros, British pounds and Swiss francs and immediately gives reliable feedback. The frame around the incorporated display lights up green for authentic banknotes, and red for counterfeit ones. To make the results even clearer it also gives an acoustic signal, which can optionally be turned off or on. 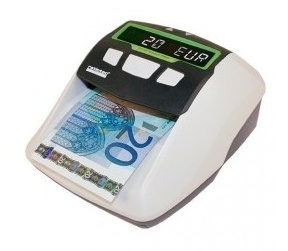 The LED display indicates the banknote‘s suspicious security features in 5 languages (German, English, French, Italian and Spanish). Thanks to its integrated USB interface you can simply perform updates via PC. You can also adjust numerous user-defined properties, such as language, signal type and energy settings directly on-site. Optionally you can operate the Soldi Smart Pro mobilely - with the separately available battery. You can also optionally receive an anti-theft plate or an adapter cable for the car.